Phyll Opoku-Gyimah is the nucleus of the award-winning celebration and protest that is UK Black Pride. 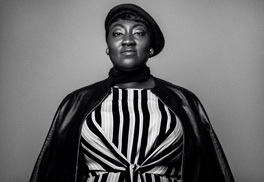 Widely known as Lady Phyll – partly due to her decision to reject an MBE in the New Year’s Honours’ list to protest Britain’s role in formulating anti-LGBTQ+ penal codes across its empire – she is a senior official at the Public and Commercial Services (PCS) trade union as the Head of Equality & Learning, as well as a community builder and organiser; a Kaleidoscope Trust Trustee; an Albert Kennedy Trust patron; Diva Magazine columnist, and public speaker focusing on race, gender, sexuality and class. Phyll has been nominated for and won numerous accolades including the European Diversity Awards Campaigner of the Year in 2017, and was named in the top 10 on the World Pride Power list. She's regularly called up to advise nascent LGBTQI organisations around the world to help leaders create cogent organising strategies, establish robust partnership networks and work effectively in service of the LGBTQI community. Queer Perspectives, which has been running since 2007, is a quarterly event which takes place on the first Friday of February, May, August and November. Resident artist Sadie Lee invites guests who identify as LGBTQI to select, discuss and highlight works in the Collection and beyond which have a personal resonance, often teasing out surprising links and hidden histories. Past guests include Ali Smith, Sunil Gupta, David McAlmont, Andrew Logan, Amy Lamé, Richard Dyer, Alan Hollinghurst, Neil Bartlett, Scottee and Bird la Bird.